What Type of Grout Should I Use? In years past there have been two basic types of grout for tile installations: cement grout or epoxy. 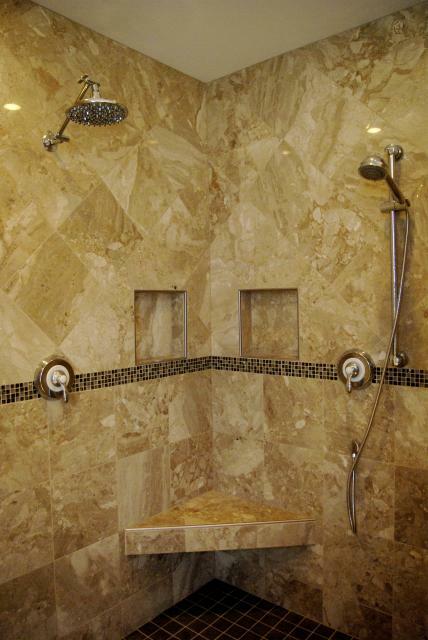 A few years ago StarQuartz grout emerged on the market, a pre-mixed urethane grout. It largely flew under the radar but urethane grouts are starting to become a commonly used grout material. Traditional cement based grouts are still a fine option, particularly when coupled with an acrylic admix. They are the most inexpensive type of grout available and should be sealed after they are cured, particularly in areas like showers and kitchen backsplashes where they'll be exposed to water or mama's secret recipe homeade tomato sauce. A worthy financial investment is to upgrade to an epoxy grout which has great stain resistance and is much stronger grout material, more resistant to cracking. Urethane grouts tend to fall in between cement and epoxy grouts from a pricing standpoint while still offering excellent stain resistance. They also remain more flexible than epoxy which can be very desirable when used with certain types of tile. They do require a longer set-up time before they can be walked on or exposed to water and this must be taken into consideration when choosing your grout. StarQuartz reports to be working on a new formula with a faster set-up time. When using any grout, be sure to thoroughly read the installation instructions and make sure you understand how to mix the product properly, how to install it properly and how to clean it up. Don't be afraid to call the manufacturer if you are unclear on any of these points, a few stupid questions is a small price to pay when compared to a grout installation gone awry! Next post: What Does ‘Quality Material’ Mean?